WHEN: Friday, April 19, 6 p.m.
Read complete article on theguardian.com. Tarak and Ken walked out of jail at about 12:35 Irish time–Ed Horgan was literally waiting outside the jail for hours after all the paperwork was done. Tarak spoke briefly with Ellen Davidson and said they were very glad to be out, but that they had made some good friends in the prison, among both the guards and the prisoners. “The memory of 1916 is very real to them,” said Tarak, “and both guards and prisoners encouraged us to keep protesting.” They will probably be busy in the upcoming days–the Irish Times has been asking for an interview with them, and there will be other media as well. Their passports, as was expected, have been confiscated and they have been told they must stay in Ireland for the trial. We will be organizing support for a campaign to bring them all the way home in the next weeks, but we need to get a clearer picture from the lawyer about what it will take. In the meantime, they will be housed and fed by our great allies on the ground over in Ireland. Their next hearing is Wednesday, April 3, but it is not related to their bail conditions. It will be an important hearing, however, because the lawyers are going to make the case that the trial should be moved to Dublin, since it’s clear that there is no justice in County Clare for anyone protesting at Shannon (the U.S. military refueling stops are quite lucrative, and Shannon Airport is a major economic driver in the region). There is precedent for moving such cases, as Ed Horgan and three other activists have had their venues changed for this reason. For now, it’s a celebration, but there’s going to be more organizing needed to get them out of Ireland and home. Watch this space! The measure will surely pass the House, too, but Trump will likely veto it. Read complete article on vox.com. If anyone else were president, the “liberals” would be celebrating. After all, pulling American soldiers out of a couple of failing, endless wars seems like a “win” for progressives. Heck, if Obama did it there might be a ticker-tape parade down Broadway. And there should be. The intervention in Syria is increasingly aimless, dangerous and lacks an end state. Afghanistan is an unwinnable war – America’s longest – and about to end in outright military defeat. Getting out now and salvaging so much national blood and treasure ought to be a progressive dream. There’s only one problem: Donald Trump. Specifically, that it was Trump who gave the order to begin the troop withdrawals. Make no mistake, the Democrats have been tacking to the right on foreign policy and burgeoning their tough-guy-interventionist credentials for decades now. Terrified of being painted as soft or dovish on martial matters, just about all the “serious” baby-boomer Dems proudly co-opted the militarist line and gladly accepted campaign cash from the corporate arms dealers. Think about it, any Democrat with serious future presidential aspirations back in 2002 voted for the Iraq War – Hillary, Joe Biden, even former peace activist John Kerry! And, in spite of the party base now moving to the left, all these big name hawks – along with current Senate Minority Leader Chuck Schumer – are still Democratic stalwarts. Heck, some polls list Biden as the party’s 2020 presidential frontrunner. Enter Donald Trump. Ever since the man won the 2016 election, Maddow’s nightly show has been dominated the hopeless dream of Russia-collusion and a desire for Trump’s subsequent impeachment. Admittedly, Maddow’s anti-Trump rhetoric isn’t completely unfounded – this author, after all, has spent the better part of two years criticizing most of his policies – but her zealousness has clouded her judgment, or worse. Indeed, that Maddow, and her fellow “liberals” at MSNBC have now criticized the troop withdrawals and even paraded a slew of disgraced neoconservatives – like Bill Kristol – on their shows seems final proof of their descent into opportunistic hawkishness. Read complete article on Antiwar.com. SAUL LOEB/AFP/Getty Images President Trump arrives to speak to members of the US military during an unannounced trip to Al Asad Air Base in Iraq on Dec. 26. 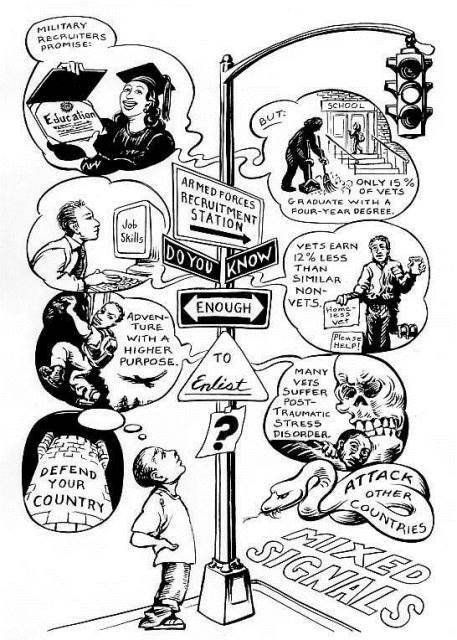 I find myself haunted these days by Pete Seeger’s antiwar anthem of 1967, written when it had become evident to Seeger and many others (although not yet to me) that the United States was engaged in an enterprise certain to end in disaster and dishonor. The Big Muddy was Vietnam. The big fool committed to blindly pushing on was President Lyndon Baines Johnson. Today Seeger’s lyrics possess an ironic resonance. The United States once more finds itself stuck in a perplexing military misadventure, this one dating from 2001 and known initially as the Global War on Terrorism. Once more we have a bona fide fool in the White House, one whose antics make LBJ look like a font of acumen and good sense. Yet note the contradiction. In this instance, it’s the big fool who grasps the obvious: Waging war to pacify the Greater Middle East hasn’t worked and won’t. However unwittingly, President Trump has embraced Pete Seeger’s cause as his own. Yet we have it from the nation’s putative “wise men” that the fool is dead wrong. Much as in 1967, members of the foreign policy establishment (today very much including women) say that the United States has no choice but to push on, no matter how dark the night or deep the water. So when Trump recently announced his intention to withdraw US troops from Syria and cut in half the troop contingent in Afghanistan, reaction from across that establishment was swift, severe, and all but unanimous. Terminating lengthy wars in places of marginal importance to the United States, it turns out, represents the height of irresponsibility. For Defense Secretary James Mattis, Trump’s announced intention to pull out of Syria was the last straw: He resigned (and was then unceremoniously fired). In an instant, Mattis — widely proclaimed as the last adult in the room — became the recipient of encomiums usually reserved for icons like George C. Marshall. With Mattis gone, it is said, the way is now clear for Trump to convert America First from provocation into policy. We thus find ourselves at an interesting, and perhaps pivotal, moment in American history. At issue are the prerogatives of the commander-in-chief. Since World War II, those prerogatives have expanded exponentially, so much so that in practical terms the Congress has all but forfeited its war powers to the executive branch. For decades now, presidents have used those powers to initiate, expand, and redefine armed conflicts more or less at will, Vietnam being only one example among many. Underlying this practice is an assumption: That the president, drawing on the expert advice of the foreign policy establishment, is uniquely situated to divine and to pursue the nation’s true interests. Especially in matters related to war, we the people, not to mention our elected representatives, are expected to respect his decisions. Acting on that assumption finds the United States today mired in several armed conflicts that members of the establishment accept as more or less perpetual. In Syria, Afghanistan, and elsewhere, their inclination is to press on. Deeply invested in a militarized and interventionist conception of demonstrating global leadership, they will admit to no alternative. The commander-in-chief begs to differ. Exercising prerogatives enjoyed by his predecessors, he appears determined to wind down conflicts he considers contrary to the nation’s interests. The big fool apparently thinks that interminable wars are a bad thing. Trump’s conviction places him directly at odds with and also threatens the foreign policy establishment. After all, the status of that establishment derives from the claim that listening to the likes of James Mattis keeps America safe and strong. If presidents cease to listen, then the entire raison d’etre of that establishment, which is both unelected and unaccountable, collapses. In that event, a genuine debate over America’s role in the world might ensue. Alternatives to the existing militarized and interventionist conception of national security policy just might become possible. This is what the foreign policy establishment fears most. And that’s why it will fight tooth and nail to obstruct Trump’s efforts to end armed conflicts that he correctly sees as misguided. In establishment circles, the big fool’s opposition to foolish wars will become one more indication that he is unfit to serve. Hani Mohammed/ASSOCIATED PRESS A father gives water to his malnourished daughter at a feeding center in a hospital in Hodeida, Yemen. 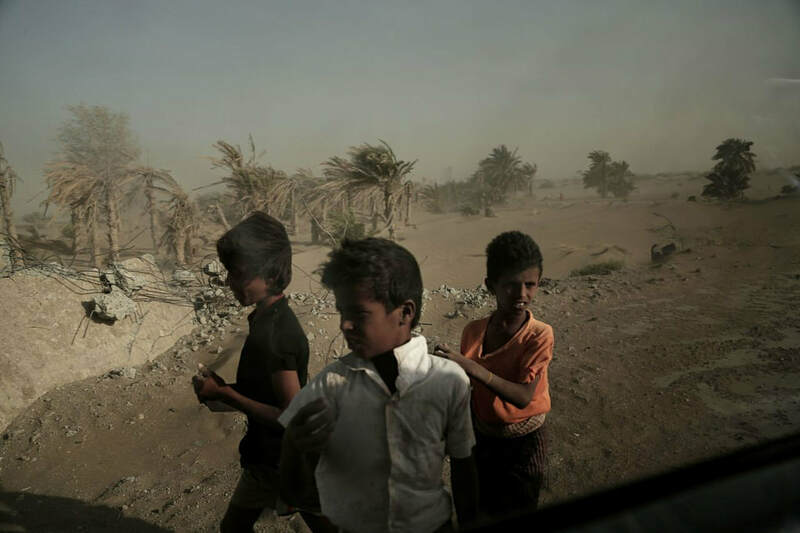 An international aid group says an estimated 85,000 children under age 5 may have died of hunger and disease since the outbreak of Yemen’s civil war in 2015. WASHINGTON ― A slim majority of senators voted Thursday to end U.S. support for a Saudi Arabian military campaign in Yemen that has been blamed for tens of thousands of deaths and mass starvation. The vote provides the biggest rebuke yet of a three-year U.S. policy that the Trump administration says it has no plans to end. The historic 56-41 vote on a resolution from Sens. Bernie Sanders (I-Vt.), Chris Murphy (D-Conn.) and Mike Lee (R-Utah) represents the first time the Senate has voted to end a U.S. military operation not approved by Congress. It’s also a major loss for the Saudis, who are already worried about mounting criticism in Washington over their government’s role in the murder of Washington Post columnist Jamal Khashoggi. But the passage of the resolution is symbolic, at least for the moment. It will not legally require President Donald Trump to withdraw American intelligence and logistical assistance for the Saudi effort because the GOP has quashed attempts to pass similar bills in the House this session and, even if passage there was possible, Trump has already threatened to veto the resolution. Read complete article in HuffPost. 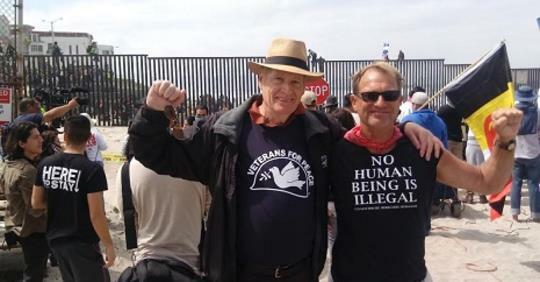 Members of San Diego Veterans For Peace marched to the border with Tijuana, Mexico on Sunday, November 25, as part of a San Diego coalition expressing solidarity with and support for thousands of Central American asylum seekers. VFP members were on both sides of the border and joined in with a march of asylum seekers on the Mexican side. So we had a good look at the crisis which was contrived by the Trump administration to make it look like there was indeed an "invasion" of "criminals" and "terrorists." A perfectly peaceful march turned into chaos when the legal entry point to where the asylum seekers were headed was closed off by Mexican authorities, presumably at the request of Homeland Security. When some marchers then surged toward the border wall, Customs and Border Protection (CPB) officers wasted no time in firing multiple CS (tear gas) canisters across the border into Mexico, causing great chaos as mothers fled with their choking children. As if on cue, U.S. authorities then totally shut down the busiest border crossing in North America, an exercise they had been practicing during the week. Soon Marine helicopters were landing on the railroad tracks next to the border, and Marines, apparently armed, were fanning out along the border fence. At the same time, 300 Army soldiers with shields and clubs stood menacingly behind CPB officers. A number of arrests were reportedly made on both sides of the border. Curiously, the U.S. says the 46 people it arrested will not be prosecuted. Mexican police, who were noted for the low key presence and nonviolence during this contrived event, also reported arresting several dozen people whom they say will be deported back to their home countries in Central America (primarily Honduras, where government death squads and violent gangs await their return). In the meantime, rains and a shortage of food and shelter for the asylum seekers in Tijuana are turning an already difficult into a serious humanitarian crisis. As many as one-third of the 6,000 or so asylum seekers are suffering from respiratory and other illnesses. Mexico's federal government has provided no aid, and the mayor of Tijuana says that the city can provide little further assistance. NGO's on both sides of the border are doing what they can to help, but so far their efforts are insufficient. The Unified U.S. Deported Veterans chapter of Veterans For Peace has also been helping asylum seekers who are camped out at the border, only about a half-block from their office. The Deported Veterans have experience with this, as they have helped previous caravans of asylum seekers as well. They are supplying food, water, blankets, and now seek to provide much needed tarps. San Diego VFP is helping out with this. Ultimately, they would like to provide backpacks filled with essential items. Most needed are dollars, which can be used to purchase essential items in Mexico. You can donate directly through a special link on the VFP website. Just indicate that your donation is for the asylum seekers. VFP members who work with the Deported Veterans to assist the asylum seekers will be welcomed in Tijuana. San Diego Veterans For Peace will also be participating in a series of solidarity actions at the border, along with immigration justice groups, human rights groups, churches, peace groups and the Poor People's Campaign. VFP members will also be reaching out to soldiers and Marines to let them know they will have our support if they refuse to obey immoral or illegal orders. Tucson Veterans For Peace will be part of a coalition of groups who will protest outside the Davis-Monthan Airforce Base in Tucson (Saturday, Dec. 1, 9-11 am) that is also housing Army troops that Trump has deployed to the border. There are also discussions about organizing a Christmas holiday vigil outside the children's detention center at El Paso, Texas. All of these plans are in formation. 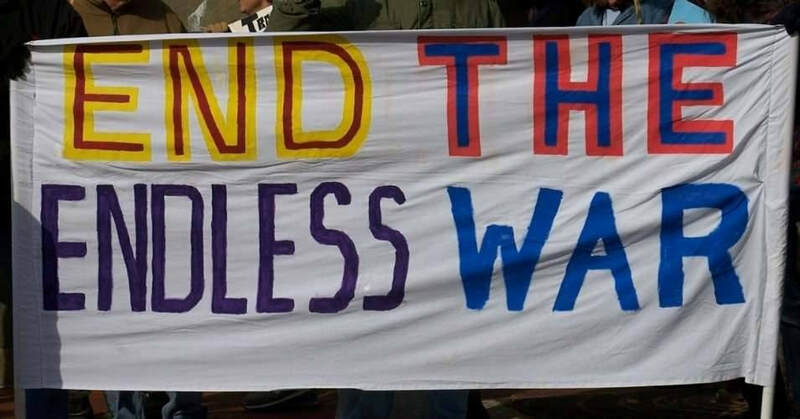 VFP members who are interested in joining border actions in California, Arizona or Texas should email Gerry Condon at gerrycondon@veteransforpeace.org or phone him at 206-499-1220. The bells at the Church of Assumption in downtown Bellingham rang 11 times at 11 a.m. on Sunday, November 11. Their slow, rhythmic beats commemorated the 100th anniversary of Armistice Day. Local activist organization Veterans for Peace and Armistice Day supporters stood in silence across the street, flags for peace waving in the crisp autumn air. The first Armistice Day at the eleventh hour on the eleventh day of November 1918 signaled the halt of World War I and the start of a new era of peace, said Stan Parker, Army veteran and a member of the Veterans for Peace Board of Directors. The Bellingham celebration was organized by the Veterans for Peace Chapter 111. Among them was Gene Marx, a Vietnam Navy veteran and Veterans for Peace local communication coordinator. Parker said he came to the rally in remembrance of those who lost their lives in war and also those affected by war. His call-to-action: war is not the answer to the problems of the world. “There was a time in the world’s history when we really believed we could have world peace, where war was not the answer, and world peace was possible,” Parker said. Today, Armistice Day is celebrated in countries across the world. Across the Canadian border on Sunday, crowds of citizens wore red poppy pins as they gathered. The flower is a symbol of remembrance of the emotional and physical expenses of war. The United States made the decision to replace Armistice Day with Veterans Day in 1968, even moving the holiday to a Monday to encourage commerce, according to the Department of Veterans Affairs. 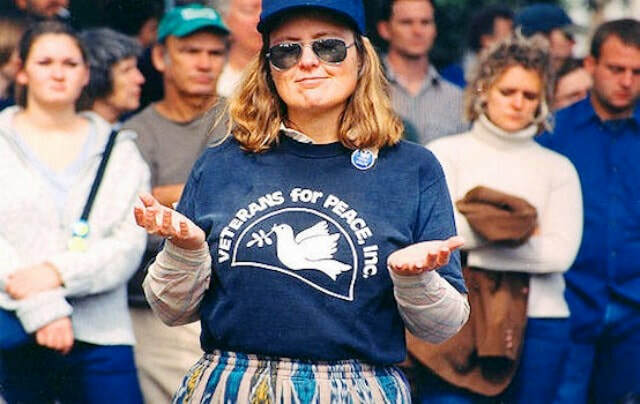 Lisa Distler, whose late husband, Bill Distler, was a Vietnam veteran and a founding member of Veterans for Peace, said the message of Armistice Day is one simply of peace; to put one’s arms down and come to an agreement that we as humans shouldn’t kill one another to solve our issues. She believes the newer U.S.-coined holiday has lost that message. She said Veterans Day glorifies the act of going to war which is counterproductive to having a more inclusive and peaceful world, or recognizing the trauma that violence can inflict. Daniel Kirkpatrick describes himself as a lifelong pacifist who comes from a long line of pacifists. His father was a conscious objector to World War II – his brother, an objector to the Vietnam War. “We need a shift in a big way, we need a huge shift in our patterns of funding and supporting militarism and we need to shift towards a peace orientation that will bring prosperity to people across the world,” Kirkpatrick said. Veterans for Peace meets on the third Friday of each month at the Community Connections building, part of the Community Food Co-op downtown. More information can be found on their website, www.vfpbellingham.org. Bellingham's Veterans For Peace, with more than twenty other supporters of peace, gathered on a brisk, sunny morning last Sunday in solemn commemoration of the 100th year anniversary of the end of the First World War. At 11 am - the 11th hour of the 11th month - the bells of the Church of the Assumption slowly tolled, along with thousands across the country. Heads were bowed in tribute in remembrance of the millions slaughtered needlessly in the "War to End All Wars". An annual observance by VFP-111, this year's observance was part of the VFP International Reclaiming Armistice Day campaign This education effort was initiated to call attention not only to end of hostilities in 1918 but also to the fact that Armistice Day, originally designated to the cause of world peace, was co-opted by the US government and renamed Veterans Day, now a national holiday venerating not peace but military service in our endless wars. I feel, this Armistice Day anniversary is a most profound moment, for us to stop for even one moment, a possible, sacred sixty seconds, that might allow us to silence the cyclonic, squall of insanity that portends our own Manchurian reality. So for this weekend, give us peace. Lay down the fear of all that desperately conspires to destroy our peace of mind, sanity, and courage. Ring the Bells!!! That is the only sound I think most of us might be able to really hear, right now. To VFP - Thank you kindly for making this happen. As a veteran, I will not be misled and victimized once more by the militarists and war profiteers. In accordance with this resolution, President Calvin Coolidge issued a Proclamation on November 3rd 1926, “inviting the people of the United States to observe the day in schools and churches or other places, with appropriate ceremonies expressive of our gratitude for peace and our desire for the continuance of friendly relations with all other peoples." Finish the article on Common Dreams. WCAA Site destroyed, intimidation and a "revenge flight"
The West Coast Action Alliance’s extensive web site was taken down and completely destroyed in July 2018 without our knowledge or consent. It contained more than four years’ worth of legal analysis, reporting, and whistle blower materials on the US Navy’s unprecedented expansion of warfare activities that are affecting communities in western Washington’s Whidbey Island, the San Juans, and the Olympic Peninsula. 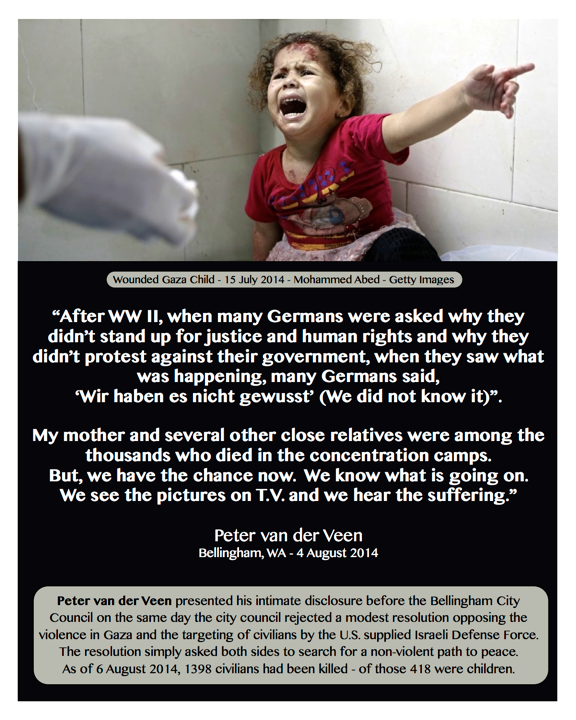 Read entire article on Counterpunch. In fact believing that further sanctions and Security Council pressure will break the DPRK commitment to the bomb is a risky naiveté. With no reasonable threshold anticipated in either case, the Trump administration might well take a lesson from the Richard Nixon template of normalizing relations with a future, legitimate atomic adversary. The nuclear rise of a bellicose outlier like “Red” China in 1972 demanded resolution. A time-line of deliberate negotiations - Track 2, followed by more open discussions - arguably eliminated that nuclear stress. As a first step toward a diplomatic solution with Pyongyang, please encourage Senators Murray and Cantwell, and Representatives Larsen and DelBene to support S.2047 / S.2016 and HR 4837. The author of this piece is Veterans For Peace Past VFP Board Secretary and Naval Aviation Veteran Gene Marx. He is also an active member of the CPL Jonathan Santos Memorial Veterans For Peace Chapter 111 and lives in Bellingham, Washington with his wife, Victoria. Read the rest of the article in the The American Conservative. Interested in joining the Whatcom Peace & Justice Alternatives to Military Service volunteer crew? WPJC could really use veteran perspectives. The time commitment is up to you -- some folks volunteer for 2 hours per semester, and others put in more than 20. Come and learn how to table with AMS and then sign up for shifts that work for you. The BHRFF is an annual film festival that screens independent films concerning global issues. All films are selected by a volunteer committee. The festival is free to all. Films are followed by discussions facilitated by the film director or a community resource affiliated with the film topic. "Well, my friends, the beer that I brewed with Menace Brewery and the Bellingham Beer Lab is finally on tap at Menace! It is the Billy D Memorial Lager. It is a tribute to my dear friend, Bill Distler, who passed this year. 10% of what you pay is donated to the local chapter of Veterans For Peace. We will have a release night next Monday at Menace Brewery. I'm not sure of the time yet but will post it after Thanksgiving. On that night we will toast Bill and share fond memories. Save the date attend please show up, if you can! Cheers!" Join us. Lift a pint to Billy D...and PEACE! 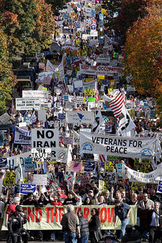 Veterans For Peace calls for the observance of November 11 to be in keeping with the holiday’s original intent as Armistice Day, to be “a day dedicated to the cause of world peace," as it was celebrated at the ending of World War I when the world came together to recognize the need for lasting peace. That desire for peace led ten years later to the General Treaty for the Renunciation of War (Kellogg-Briand) which made war illegal. The U.S. ratified the treaty and is bound by its terms pursuant to Art. 6 of the Constitution. After World War II, the U.S. Congress decided to rebrand November 11 as Veterans Day. Honoring the warriors quickly morphed into honoring the military and glorifying war. Armistice Day, as a result, has been flipped from a day for peace into a day for displays of militarism. This year with a rise of hate and fear around the world it is as urgent as ever to ring the bells of peace. We in the U.S. must press our government to end reckless rhetoric and military interventions that endanger the entire world. Instead of celebrating militarism, we want to celebrate peace and all of humanity. We demand an end to all forms of hate, patriarchy and white supremacy and we call for unity, fair treatment under the law and equality for all. We call for a tearing down of walls between borders and people. We call for an end to all hostilities at home and around the globe. Since 1998, Children of Vietnam has been serving the children in Vietnam whose futures are stifled by poverty: educating minds, mending bodies, sheltering families and nurturing their development. There are thousands of children just like this year's beneficiary of our donation, Vo Van Quang, who deserve access to a better life. Children of Vietnam is working diligently to make this a reality through its innovative program Hope System of Care. Read the rest of the review on the London Review of Books. This is a video clip of Veterans For Peace Co-Founder Doug Rawlings that Maine Public Television plans to air several times before the airing of Ken Burns' The Vietnam War. VFP chapters plan to counter the documentary with our voices. My sweet husband, Bill, " walked on" this morning at around 7:00 a.m. I'm so grateful to have had slept by his side for one last night. What a beautiful spirit he has. What a loving, brilliant, difficult, and inspired husband and lover I have had! 26 years of loving Bill Distler and having his baby, I have been richly blessed. Now to cope, while you're letting that sink in. Peace now, my friend. Presente! On Saturday, June 10, graveside services will be conducted at Bayview Cemetery at 12 noon, followed by a celebration of Bill's life at Westford Funeral Home, 1301 Broadway, Bellingham, at 1 pm. On Contact's Chris Hedges discusses the hidden tragedy of the Vietnam War with author of Kill Anything that Moves: The Real American War in Vietnam.